Left to right: Bob Bernauer (Tinicum Township Wastewater Treatment Plant Head Operator), Walt Lee (Public Works Department Superintendent), Lisa Edmiston (Commissioner), Pat McCarthy (Commissioner), Kevin Kerns (CEO of Tri-State Training and Safety Consulting, LLC), Steve Edmiston (Police Chief), Captain Ken Dawson (EMT), Tom Giancristoforo (Board President), CJ Kline (EMT), and David Schreiber (Township Manager). 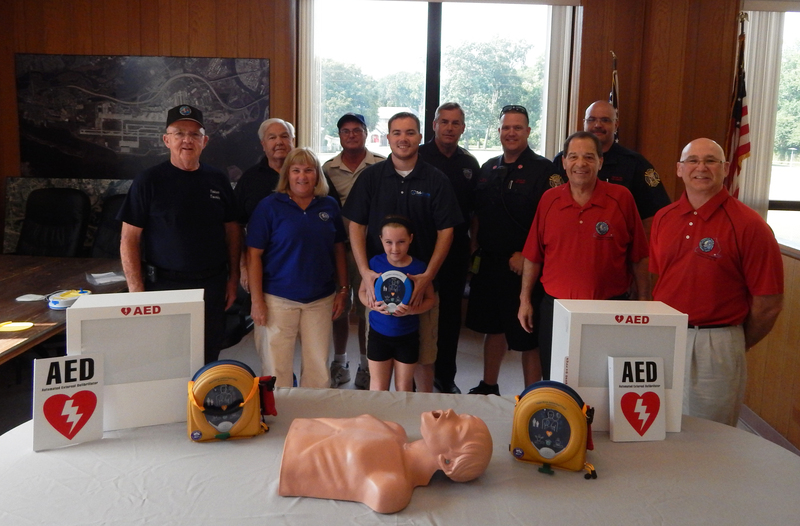 The township, located in Delaware County, has purchased ten HeartSine samaritan® PAD AEDs to place in various locations throughout the municipality, including the following places: Town Hall, Library, Public Works Department, Wastewater Treatment Plant, police station, various sports fields, and in its ambulances. Equipping the township came at a good time, as the municipality expects thousands of visitors due to the upcoming Papal visit of Pope Francis from September 26-27, 2015. The HeartSine samaritan® PAD 350P (SAM 350P) AED, a device that analyzes the heart rhythm and delivers an electrical shock to victims of SCA in order to restore the heart to normal rhythm, will guard the Township’s population in the event of a SCA, an often life-threatening condition in which the heart stops beating without warning. Many of the Township’s board members are lifelong members of the Tinicum Township Fire Company, which led to the decision to equip the Township with AEDs, as they have witnessed first-hand the severity of SCA and understand the true value of a defibrillator. HeartSine’s Forward Hearts programs lets survivors of a Sudden Cardiac Arrest event, in which a HeartSine defibrillator has been used, to potentially save another life by donating a HeartSine samaritan® PAD to the charity or organization of the survivor’s choice. The AEDs were sold and installed by HeartSine’s Authorized Distributor, Tri-State Training and Safety Consulting, LLC.